Turnout in today’s 26-County referenda could be close to a record low as voters appear to be staying away from a potentially historic ballot on the abolition of the Seanad, the upper chamber of the 26-County parliament. Thousands of polling stations opened at 7am and will remain open until 10pm tonight. Voters are being asked to decide on two questions, whether they want to abolish the Seanad and whether to establish a Court of Appeal. While there has been no public opposition to the establishment of a Court of Appeal above the High Court, the move to abolish the Seanad requires one of the largest changes ever made to the 1937 Irish Constitution. If the Seanad referendum is passed, the Upper House will be abolished after the next General Election and over 40 changes to the constitution will come into effect. Frustration at the refusal of the government to allow the consideration of alternatives to the House’s complete abolition -- with Taoiseach Enda Kenny himself refusing to participate in a television debate -- appeared to fuel support for the ‘No’ campaign in recent weeks. However, the government parties and Sinn Féin today expressed confidence that a strong anti-establishment and anti-elitist sentiment would win the day for the ‘Yes’ campaign. 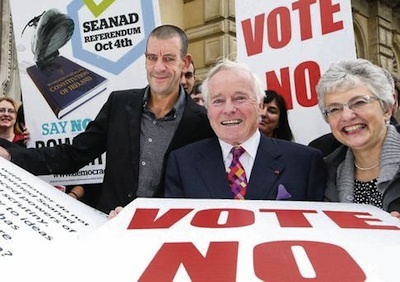 Richard Bruton, Fine Gael’s campaign director, said there was a compelling case for abolishing the Seanad as it was “an obsolete institution which has served the interests of the politicians much more than the citizens”. But Fianna Fáil leader Micheal Martin said he could sense a growing ‘No’ vote, as people on the doorsteps were saying they did not like the idea of more power being centred in the hands of the government. Opinion polls published last month suggested both referenda will pass easily enough, although turnout, expected to be below 40%, could heavily influence the result. By lunchtime, reports around the country indicated a turnout as low as 6%, and by mid-afternoon had still not reached 15% in Dublin. Sinn Féin’s Seanad referendum campaign director Pearse Doherty TD made a final call on voters to come out in support of the abolition of the Seanad. He said a vote against the government by Senators on Wednesday was “a last ditch attempt by some senators to show that the Seanad can be relevant. “However, when it was important to stand up, when for instance the property tax was going through the Seanad, the Seanad did what it always does and rubber stamped the government’s bill. “I am making a final appeal to voters to come out in huge number tomorrow to abolish the Seanad. * Full results of the referendum counts will be published here tomorrow.